If I've said it once, I've said it a thousand times. I love hard anodized cookware! It's easy to clean. It's durable. It's a great conductor of heat. 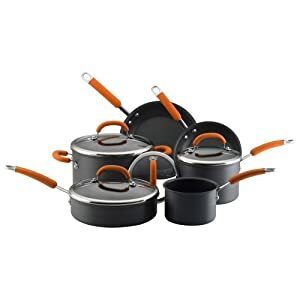 This set from Rachael Ray currently has over 300 reviews with an average of 4.5 stars. Any time that many people love it, you can rest easy about the quality. Join in and write your own page! It's easy to do. How? Simply click here to return to Cookware Reviews.